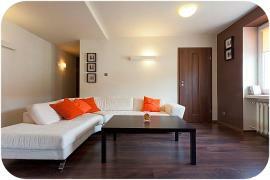 Modern suit situated in the heart of Kazimierz, the lively Jewish Quarter of Krakow. The apartment consists of 2 bedrooms, a fully-equipped kitchen and an elegant bathroom. In the bedrooms there is a double bed and a comfortable double sofa, in the living room a relaxation corner (TVsat, DVD, wifi internet access). The apartment sleeps up to 4 people. Besides an apartment offers a balcony. There is also a bathroom with a shower; and a hall with a built-in wardrobe. rish Apartment is located in Kazimierz, the lively former Jewish district of Krakow, now - a part of the Old Town of Krakow. A small town in a big city, Kazimierz owes its unique atmosphere to the historical neighbourhood and has many interesting attractions: galleries, antique shops, small restaurants, cafes and pubs. For those who are interested in visiting historic monuments, museums, galleries, churches and synagogues, our apartment is a perfect starting point. There are good local shops, plenty of places to eat out (regional cuisine, Jewish cuisine, vegetarian meals, etc.) and probably the best pubs in the world! Krakow is only 10 minutes from Wieliczka Salt Mines and 100 km away from Tatra Mountains and beautifull, small Zakopane.